If we’ve learned anything about this years Wyoming team it’s that we have no idea who they are. I can’t remember a Wyoming team that could realistically win or lose any given game, home or away. We’ve won on the road against Oregon State/Utah State/Colorado State but we’ve also lost home games to Denver/Northern Colorado/New Mexico. But even the most optimistic Wyoming fan would have been hard pressed to believe we were going to win at Fresno State after they completely manhandled us in Laramie a few weeks ago and coming of the disappointing home lose against New Mexico which we gave up 119 points. Fresno State also came into the game on a 5 game win streak in which they had beaten every opponent by more than 13 points. So Wyoming decides to pummel them in the first half and do just enough in the 2nd half to hang on for a ten point victory! Getting Alan Herndon back was a major boon to our defense. By no means is he the only difference between giving up 110 points against New Mexico to only allowing 68 points to Fresno State, but he was certainly the chief component to our staunch defense against FSU. He blocked 4 shots had altered many more helping Wyoming hold the #1 field goal and 3pt shooting team well below their season averages. I also thought Herndon attacked the boards (8 rebounds) instead of being the reactionary rebounder he normally is. Herndon has a reputation of being weak and always hurt (some of this is definitely deserved), but he hasn’t missed a game since his freshman year when he had mono. Maybe he is more of a gamer than we give him credit for. Hayden Dalton and Justin James are turning into quite the dynamic duo for the Pokes. Dalton had 17 points 9 rebounds doing most of his damage in the first half (15 points in the 1st) and helping Wyoming gain a 17 point lead at halftime. James on the other hand was much more consistent with his 26 points (12 in the 1st/14 in the 2nd) and was almost our entire offense for a majority of the second half. For the first time maybe all season James was consistent with his 3ball (4-7 from arc), if he has all of a sudden found his stroke from deep things could get real interesting in Vegas. On the season James is averaging 19 points 6.2 rebounds 3 assists and shooting a very sold 46.4% from the field, while Dalton is averaging 18.2 points 8.1 rebounds and shooting 46.7% from the field/84.8% from the strip/41% from three. I know their numbers are somewhat inflated by our fast pace of play but James/Dalton has to be on the short list of offensive duo’s Wyoming has had in recent history (others receiving votes Adams/Nance, Ewing/Jones, Bailey/Davis). I thought this was quite possibly our best rebounding game all season. We won the rebounding battle by only 2, but for us to win the rebounding battle at all is rare much less on the road against a physical team like Fresno State. Usually a good indication if the bad Wyoming team or the good Wyoming team showed up can be reflected in how many offensive rebounds we gave up. In games we struggle it seems teams get chance after chance on the offensive glass swatting away Wyoming players like flies. But that wasn’t the case against FSU, we dominated the defensive glass only allowing 5 offensive boards. It was an impressive well rounded display on the boards (Dalton nine rebounds/Herndon eight rebounds/James five rebounds/Gorski five rebounds) by the Cowboys and the type of effort we need to see moving forward if we want a chance to compete come March. Alexander Aka-Gorski has been the brunt of a lot of well deserved criticism. But give credit to the guy who could have easily tucked his tail and coward in the corner but instead he is showing signs of life. Gorski has scored in double figures 4 of the last 5 games, and while his three point shot hasn’t improved drastically he is starting to do some damage inside the three point line. 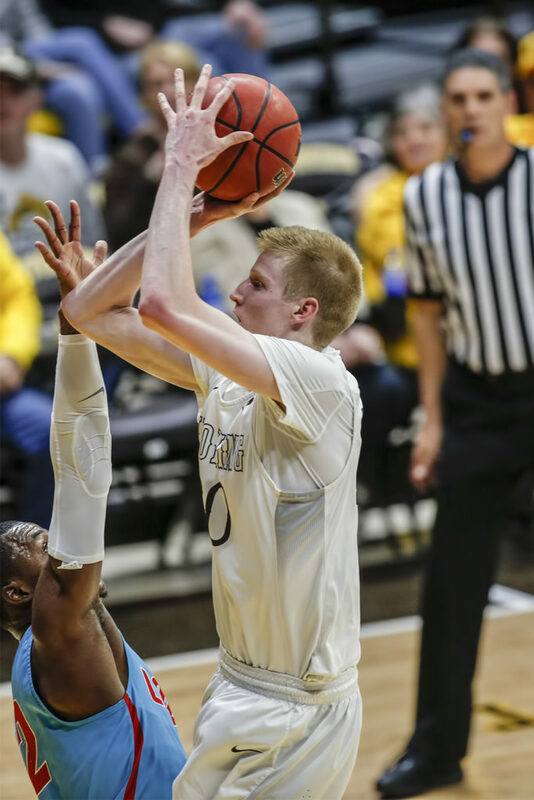 Against Fresno State which very well might be his 2nd best game in his career at Wyoming it seemed we tried to get him matched up against smaller guards in the paint and Gorski looked very comfortable scoring in the painted area. Quite the drastic change for a guy who used to attempt all his shots beyond the arc. While Gorski is just a piece player in the best of circumstances it is nice to seem him finally deserving of the minutes he has been getting most of the last 2 years. A interesting and somewhat disturbing stat, Gorski has the tenth most made three’s in Wyoming basketball history. Lou Adams in my mind continues to be the x-factor for this Wyoming team. If he can play with a controlled aggression like he did in the 2nd New Mexico game or the 1st Nevada game we are an extremely dangerous team. But if he is the out of control turnover machine we saw in the 1st New Mexico game or the 2nd CSU game we probably won’t make much noise in Vegas. Adams possesses rare athleticism and at times he finishes at the rim gracefully like Kyrie Irving or like a hammer like Russell Westbrook but other times he finishes at the rim like Charles Hankerson running in quicksand during his 0-20 stretch during the 2014-15 season. Hopefully Adams is rounding into form at the perfect time. Wyoming is the only D1 team in the country to have 4 different players score at least 30 points or more in a game. If I was a totally homer I would make the argument that this stat is a strong indication that we will be a team to reckon with come the conference tournament in Vegas. This alone should at least give us some glimmer of hope come tournament time. There has been a lot of doom and gloom around this particular Wyoming squad, much of it deserved to be sure, but for some reason this team has been discussed with more vitriol than any other Wyoming basketball team I can remember. I don’t remember Wyoming fans being this disgruntled even during the dark ages of Heath Schroyer (maybe I’m conveniently forgetting those years). I’m by no means satisfied with where we are as a program or blaming anyone for feeling the way they do, but I’m genuinely curious why this team gets so much hate when worse teams at Wyoming in the last 20 years haven’t received anywhere near the same level of criticism? Especially when you consider some of the things this team has that others at Wyoming didn’t.